Promotional Merchandise is a well proven way of getting your name and message in front - when and where it matters - and has become probably the most cost effective route to winning new business and generating valuable goodwill with clients and prospects alike. But to make your marketing effort more effective you need to keep your ideas up to date, especially where Promotional Merchandise is concerned. 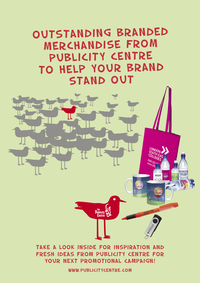 So when you need a fresh approach to promotional merchandise, call Publicity Centre and find out more about our exciting range of innovative products - all designed to help you and your message stand out from the crowd when and where it really matters - in front of your customers and prospects! We’ll be happy to provide you with information, costings and samples or meet with you to discuss how we can help you create a positive campaign to achieve your current and future marketing & communication objectives. And remember, at Publicity Centre we can help you with ALL your other marketing services needs - promotional merchandise, graphic design, print, exhibition systems, and more - so for a refreshingly different approach, call us today. You will find our friendly approach refreshing and our one-stop shop approach to marketing services will be cost effective and efficient, and our proven experience and expertise will work hard to help you achieve success. We have ISO 9001 and ISO 14001 Certification and are bursting with enthusiasm and ready to help your business win, - ready to help you win more business! With sales offices in London and Cardiff, we’ll be happy to provide you with information, costings and samples or meet with you to discuss how we can help you create a positive campaign to achieve your current and future marketing & communication objectives.